This entry was posted on Sunday, July 30th, 2017 at 3:18 pm and is filed under Action, Drama, Thriller. You can follow any responses to this entry through the RSS 2.0 feed. You can leave a response, or trackback from your own site. It will happen, more often than I care to admit, that I pick a movie strictly on name recognition of actors I like or directors who have proven they can deliver the kind of movies I enjoy, and automatically add to my go see list. Charlize Theron is one of those names and this movie is on my list. It won’t be on my list for long simply because I’ll be seeing it very shortly. I appreciate your review for elaborating on David Leitch; I think he may end up on that list of recognized names I mentioned, if Atomic Blonde and Deadpool 2 make me has happy as I am eager to watch them. I loved the first Deadpool and sequels usually don’t always satisfy me as originals but they can and I hope Leitch makes it happen (needs to have a good humour as the first, like you said). 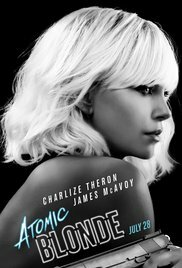 I already hope Atomic Blond rewards its investors and Charlize enough to make possible a sequel too. I simply can’t get enough Charlize. Ray, your appreciation for Charlize confirms the good taste that I already knew you possessed. She is fun to watch in this one, though I do wish the script offered a bit more. Now that I’ve seen it, I confirm I was not disappointed. The ending was not expected, but I also liked that. I won’t spoil it for the readers but you know what I mean. I liked James McAvoy’s bad guy performance, he ought to do more of them, it works for him.